An anatomically accurate composite (plastic) model of the skeleton of a dog featuring a removable tail and skull with jaw on spring. Mounted on sturdy display base. A great educational and illustrative model. 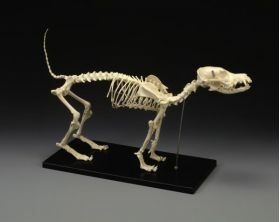 We also offer many other Professional Veterinary Models including the complete Large Canine Skeleton, Feline Jaw with Teeth, Clear Feline Jaw with Teeth, Canine and Feline Anatomy Flashcards, Canine and Feline Anatomy Posters, Canine Knee, Canine Pelvis, Canine Elbow, Canine 5 pc Vertebrae, Canine Heart (with heartworm), Canine Jaw (with teeth), Clear Canine Jaw with teeth, Canine Shoulder and Equine Models.